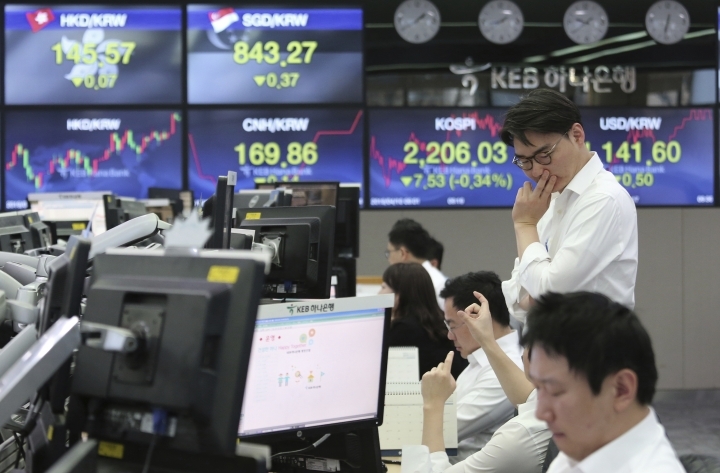 TOKYO — Asian shares fell Wednesday following a slide on Wall Street amid growing tensions between the U.S. and the European Union and a dim forecast on global economic growth. Japan's benchmark Nikkei 225 dropped nearly 0.8% in morning trading to 21,635.16. Australia's S&P/ASX 200 slipped nearly 0.1% to 6,217.30. 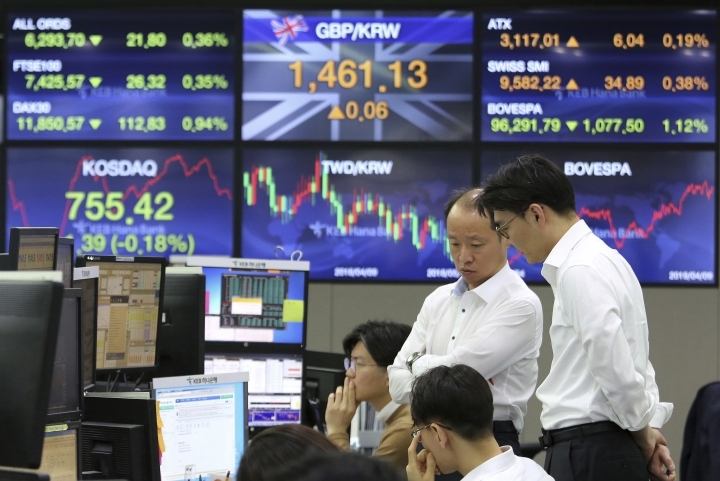 South Korea's Kospi lost 0.2 % at 2,209.21. Hong Kong's Hang Seng shed 0.8% to 29,925.15, while the Shanghai Composite was down nearly 0.9 percent at 3,211.36. On Wall Street, the S&P 500 index fell 17.57 points, or 0.6%, to 2,878.20. The Dow Jones Industrial Average dropped 190.44 points, or 0.7%, to 26,150.58. The Nasdaq composite slid 44.61 points, or 0.6%, to 7,909.28. The Russell 2000 index of small-cap stocks gave up 19.32 points, or 1.2%, or 1,559.68. Traders also were disappointed to see that the International Monetary Fund lowered its forecast for global growth this year. The IMF now projects 3.3% global growth in 2019, matching the weakest year since 2009. The U.S. fared particularly poorly in the report, with growth now expected at 2.3%, down from 2.9% in 2018. Investors will get more clues about the Fed's intentions Wednesday, when the central bank releases minutes from its latest policy meeting. The European Central Bank will also meet Wednesday. 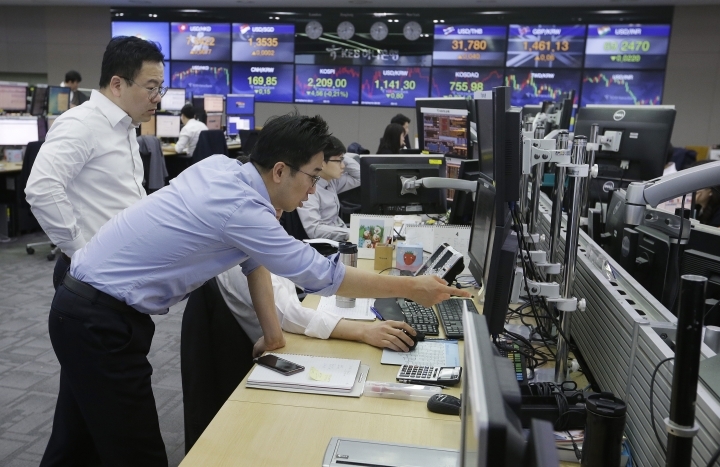 "Amid the sporing of growth and trade tension concerns once again, sentiments in Asia markets have once again been undermined," said Jingyi Pan, market strategist at IG in Singapore. Benchmark U.S. crude rose 11 cents to $64.09. It fell 0.7% to settle at $63.98 a barrel Tuesday. Brent crude added 4 cents to $70.65 a barrel. CURRENCIES: The dollar fell to 111.14 yen from 111.28 yen Tuesday. The euro inched down to $1.1257 from $1.1277.